This book was written to help you aquire skills to enjoy the outdoors. It tells you how to travel, set up camp, understand your environment, and what to do in an emergency. Some topics covered: getting lost, summer hiking, emergency kits, winter travel, avalanches, survival shelter, caves, igloo, cooking, finding water, hunting & trapping, fishing, building a canoe, compass & maps, weather & clouds, signals, ropes & knots, animals & tracks, trees, poisonous mushrooms, edible plants, first aid, and much more. Packed with B/W photos, illustrations and drawings on every page. 350 pgs. 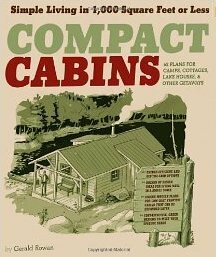 How to build a: Personal dome, compost shredder, chicken house, treadle lathe, waterwheel, juice press, root cellar, and sauna. How to: plant by the moon, prepare for frost, smoke fish, make cheese, split shakes, and much more. Illustrations. 128 pgs. by: Pleasant, Barbara & Martin, Deborah L.
The detail of 18 actual barns are examined, ranging in complexity from the simplest sun shed to an eight horse barn with a spacious home overhead. The practical advice includes detailed drawings, material lists, advice on environmental and zoning concerns, planning site location, and preparation. B/W photos & illustrations. 247 pages. 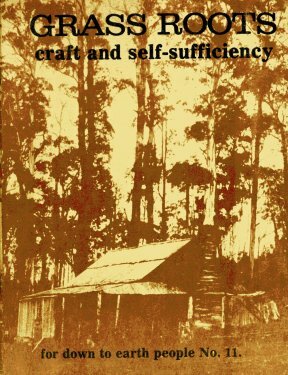 This book contains: how to look for best land; how to on building a county home and inspecting old homes; How to do: plumbing, heating, wiring, fences and gates; the tools and vehicles for the homestead; how to raise livestock; how to grow vegetables and herbs; raising fruit trees; and how to keep food. 511 pages. 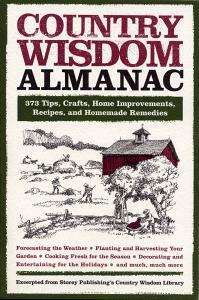 A follow-up to Black Dog's bestselling Country Wisdom and Know-How, the Country Wisdom Almanac provides hundreds of ideas and methods for living the good and simple life, plus information on weather, gardening, buying produce and cooking by season, holidays, frost dates, moon phases, and more. Divided into the four seasons and then organized into 373 individual tips, the Country Wisdom Almanac presents a wide variety of ways to live a simpler, more self-sustained life year round. Each season offers home-improvement ideas (wallpaper a room in the Fall or build a stone wall in the Spring), crafts (create gorgeous homemade decorations for Christmas, Halloween, or the Fourth of July), recipes (use seasonal produce to create fresh, healthy meals), gardening advice (what and when to plant in order to get the maximum results from your land), and more. Also included is year-round advice on caring for pets, creating your own health and beauty remedies, canning and preserving food, and more. Each season opens with a list of holidays and a guide to in-season produce. Appendices cover average weather by city and month, frost dates, and moon phases. Illustrated. 316 pgs. 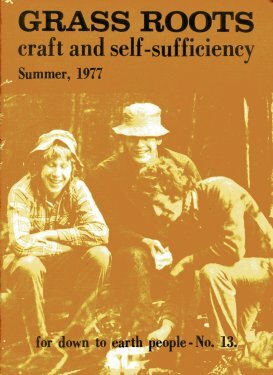 Reminiscent in both spirit and design of the beloved Whole Earth Catalog, Country Wisdom & Know-How is an unprecedented collection of information on nearly 200 individual topics of country and self-sustained living. Compiled from the information in Storey Publishing's landmark series of "Country Wisdom Bulletins," this book is the most thorough and reliable volume of its kind. 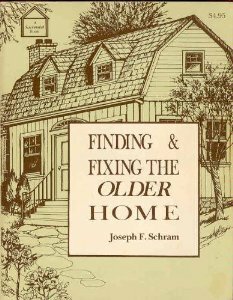 Organized by general topic including animals, cooking, crafts, gardening, health and well-being, and home, it is further broken down to cover dozens of specifics from "Building Chicken Coops" to "Making Cheese, Butter, and Yogurt" to "Improving Your Soil" to "Restoring Hardwood Floors. "1,887 illustrations, diagrams & B/W photographs run throughoutand fascinating projects and trusted advice crowd every page. 480 pgs. An up-to-date look at alternative energy houses and the many ways to live a cleaner, more natural life. B/W photos illustrations & plans. 215 pgs. What else but a pond can simultaneously increase your aesthetic pleasure, offer recreational opportunities, help the environment by providing wildlife habitat, & increase the value of your land? 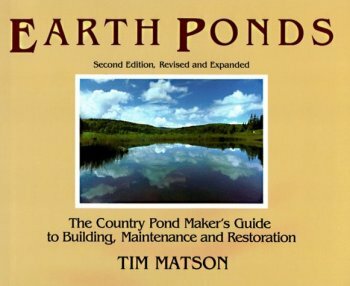 Tim Matson's classic guide Earth Ponds, first published in 1982, remains the standard reference for pond owners and builders. Here is everything you need to know to plan, dig, sculpt, maintain, & enjoy your pond, & how to to keep it healthy for years. 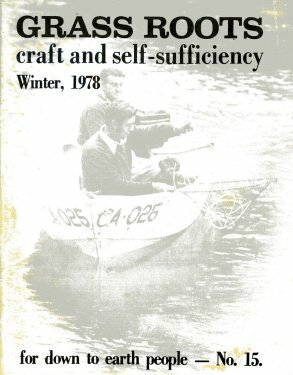 It presents hundreds of additional tips, techniques, and resources, including how to plan a pond to attract wildlife; where to buy equipment & materials; how to build rafts, docks, and gazebos, & how to deal with common problems like weeds, algae, & crayfish. B/W photos & illustrations. 150 pgs. An old fashioned recipie book for information, wisdom & practical advice. 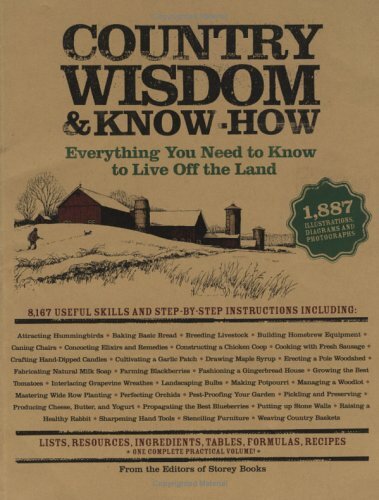 Includes how to choose & buy land, cultivate a garden, bake bread, raise farm animals, make suasage, can peaches, milk a goat, grow herbs, churn butter, build a chicken coop, catch a pig, cook on a wood stove, deliver a baby alone, prune a tree, treat bites & stings, and much, much more. This updated edition also includes more than 1500 mail-order sources, websites & email addresses. 885 pgs. 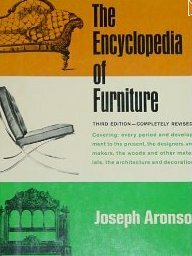 llustrated descriptions of styles and terms used for furniture. Covering every period and development to the present, the designers and makers, the woods and other materials, the architecture and decoration. 2000 illustrations. 484 pgs. An in-depth look at every aspect of selecting, maintaining, and using tractors and horse trailers. Accompanied by photos & illustrations, the authors guide you through an evaluation of the options available in tractors, from horsepower & transmission to tires & appearance. A checklist is included detailing what to look for if buying a used tractor. You will learn the kind of trucks and hookups required for towing various capacity trailers. Discussed are: floorplans, loading entry, suspension, and accomodations for horses and owners. Also included is information on smaller farm implements: loaders, spreaders, harrows, mowers, hay balers, wagons and more. B/W photos & illustrations. 181 pgs. A practical guide to permanent and electric livestock fencing on the farm and smallholding. Chapters on: tools, materials, gamenet, planning, clearing & preparation, problems, posts, stakes, attaching wire to posts, high tensil fencing, gates, electric fencing, types of fencing for different species, stiles, general maintenance, and tips. Color photos & line drawings. 128 pgs. Talk the talk of the country with Julia Rothman's entertaining and informative visual tour of life on the farm. Her drawings, diagrams, step-by-step sequences and dissections reveal everything from the parts of a milking machine and the anatomy of a pig to how to plow a field and shear a sheep. You'll be delighted by how much there is to discover. A thorough guide to designing and operating an agricultural or livestock farm. Includes explantations of the different types of farm management, production systems, and livestock systems. Complete with photos and numerous charts and tables, "Farm Management" will aid the potential farmer in getting the most out of crops and livestock. 160 pgs. An excellent text and reference on selection, operation, maintenance, and replacements of tractors and farm machinery used in agricultural field production. Equipment dealers and manufacturers, farm lenders and managers, landlords and farmers, farm operators and students will find this book useful in the selection, operation, maintenance, and replacement of tractors and other farm machinery. In addition, the management principles will be useful to students preparing for careers in agricultural education, mechanization, business, or engineering. Lots of B/W photos, illustrations, charts, and graphs. 368 pgs. The author attempts to define all that is to be seen in & around a farm. The new conservation-based agriculture movement is presented through inspiring profiles of farms and ranches across the country where healthful crops and healthy ecosystems are prospering. It offers a view of a future in which farming & ranching operations are integrated into regional networks of protected wetlands. Illustrated with over 200 color photos. 182 pgs. Guide to finding, knowing, and fixing 337 delicasies growing wild in backyards, fencepost corners, open fields, mesas, or by the lakeshore, lake or stream. With more than 500 superlatively nutritious ways to prepare them. Line drawings. 313 pgs. How to plan, install, and build fences and gates to meet every home style and property need, no matter what size your yard. Includes: classic wooden pickets, rustic wood styles, bamboo fencing, stone walls, brick and concrete, ornamental wrought iron, chain-link, mesh, barbed wire, practical rail styles for enclosing snimals, hedges, trees, ornamental grasses, gates, gateposts, and much more. Loaded with illustrations and Color photos. 261 pgs. Planning your fence, all about posts, laying the founadtion, setting posts, fence wire, wire fences, selecting & installing an energizer, electric fences, temporary fences, woven fences, rail fences, gates. Lots of B/W illustrations and drawings. 154 pgs. Written by someone who has been practising 'green' farming methods most of her life, this is a comprehensive and easy-to-follow guide to farming the traditional way. Val Porter describes the basic techniques of making a pic of land productive". Includes; soil improvement, grassland management, building boundaries, housing livestock, crop planting and management, haymaking and basic machinery. B/W photographs, illustrations. 159 pgs. Understanding house construction. plumbing, heating, wiring, lighting, fireplaces, walls, the basement, insulation, storage, painting, roofing, siding, windows, doors, add-ons, and much more. B/W photos & illustrations. 163 pgs. Improving soil, planting, septic tanks, cellars, greenhouses, specific crops & deciding what is best for your land, suggestions of animals for the small-scale farmer, marketing produce, and investing in improvements. 395 pgs. A complete guide to the methods, treatments & cures in folk and modern medicine. 22 Projects in wood for the home gardener such as: leaf grab, tomato box, cold frame, bird table, green house, trellis, planters, troughs, bird nest box, hose reel, and more. B/W photos & blueprints. 84 pgs. The history and design of British gates & stiles. Filled with color photos. 152 pgs. Learn simple inexpensive ways to: catch edible fish, mix up cake mixtures, formulas for glues & pastes, sooth burns & cuts, cure bad breath, keep & store food longer, homemade cleansers for polishing brass & silver & copper & even your car, remedies for farm animals. Includes tables for weights & measures. 416 pgs. Published in Australia, Grass Roots, "For Down To Earth People", is produced for those who wish to regain control over their lifestyle by exploring the alternatives to modern mass consumption. 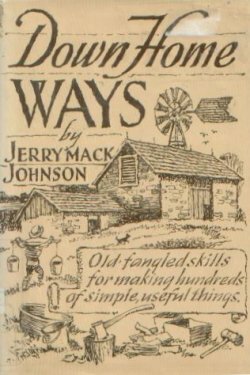 A partial list of the contents: Goose, goose, gander; Owner builders; Fitzroy fun factory; A hand woven shirt; Sunrise farm; Cooking with dried foods; Seed barter mart; Broad beans; Low energy housing part 2; Splicing; The house cow; The savories; Natural remedies for colds; and many more. Illustrations & B/W photos. 58 pgs. Published in Australia, Grass Roots, "For Down To Earth People", is produced for those who wish to regain control over their lifestyle by exploring the alternatives to modern mass consumption. A partial list of the contents: Permaculture; Water wisdom; Preserving olives; Music nights; Soapmaking; How to dye laughing; Simple queen rearing; Indoor greens; Earthworms; Simple solid fuel kilns; King Island Kelp; Herbal teas; Cashmere goats; and many more. Illustrations & B/W photos. 58 pgs. Published in Australia, Grass Roots, "For Down To Earth People", is produced for those who wish to regain control over their lifestyle by exploring the alternatives to modern mass consumption. A partial list of the contents: Windmills; Make a sock ball; Soapmaking; Birds in the garden; Permaculture; Three railed fences; Shovel, horse or tractor? ; Musical instruments for kids; The gentle art of applique; Wintering Bees; Button-making; Herbal Teas;; and more. Illustrations & B/W photos. 58 pgs. 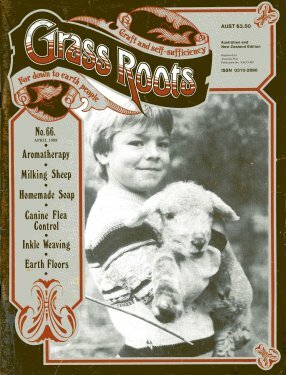 Published in Australia, Grass Roots, "For Down To Earth People", is produced for those who wish to regain control over their lifestyle by exploring the alternatives to modern mass consumption. 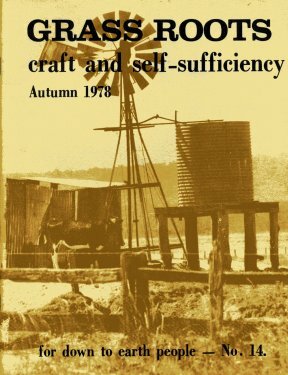 A partial list of the contents: Building - one woman's way; Aromatherapy; Sheep's milk; A useful fodder tree; Manure mania; Flea allergy in the dog; An easy woven poncho; Air ions & human health; Installing a combustion cooker; Purbred poultry breeding part 2; Just a cackle; Care of lead/acid batteries; Winter bee management; Natural Goat care; Simple felting; Homemade soap; Poetry; Custard; Greenhouse managment part 5; Concrete placing, compaction & curing on the farm; Encounters with tanks; Pruning; Crop rotation; and many more. Illustrations & B/W photos. 90 pgs. 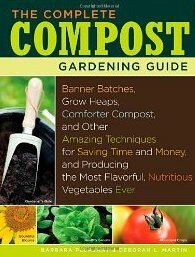 The beginner's complete in-harmony-with-nature small farm guide, from vegetables and grain growing to livestock care. Complete list & short history of each settlement, stories, shops, restraurants.